That time of year is getting closer and closer… Yes, we’re talking about Christmas, when everybody is preoccupied with decorating, shopping, or partying. And with all the fun they’re having, some of them tend to forget how important is to stay safe. 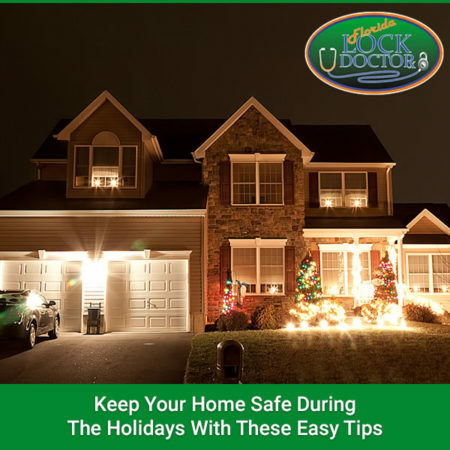 If you’re planning to be constantly on the go this holiday season and leave your house unattended, then you should definitely consider making sure that everything is on point in terms of home security. And you’re just in the right place since we made a short list with the most useful tips you can apply to keep your place safe and secure. If you’re planning to travel this holiday season, keep the plans just for yourself. Sure, it’s tempting to share this on social media, so all your friends can see how much fun you’re going to have, but this is actually essential information for thieves, as they will know when the house is empty. Posting such information is never recommended! Again, if you’re planning to leave, it’s great to know that somebody is watching over for you, as a method of improving home security. As your neighbor to keep an eye on your house and eventually inform you if there is some suspicious activity. If it snows in your area, ask the neighbor to look for your alleys, to make them look like somebody is there all the time. And as a side note, home automation can be a real lifesaver here, as you can schedule some smart light bulbs to turn on in the evening, so it will look like you are home. Sure, it can be tempting to leave all the gifts under the Christmas tree – because they look good, right? – but if they can be seen from outside, they actually look like an invite for a burglar. Especially if the tree can be observed from the window. If you’re leaving this holiday season, try putting all packages away from windows or other places with a view. After all, it will be easy for somebody to break through a window or use some locksmith skills, then grab all your gifts. Keeping your home safe doesn’t resume just to making sure that nobody breaks in, but also about keeping it in one piece. That’s why you need to inspect your Christmas lights, as they are one of the main causes of electrical fires in December. Check everything and make sure there aren’t any frayed cords or cracked lamps. And if you observe any, replace them immediately, so you can prevent accidental fires. Oh, and always check the packaging, to see that the manufacturer’s name, as well as the information, is clearly marked. Sure, this sounds like a no-brainer, but It’s actually the first home security measure one should take before leaving home during the holiday season. You might be rushing to get somewhere, but always take a few minutes to check if all the doors are shut. One moment can make a difference! And if you are worried that your doors might have problems, you can always use the help of a professional locksmith, who can check if things are alright. And Florida Lock Doctor is the best solution for this! Besides checking your doors, they’re offering a full range of residential services, starting with high-security locks and ending with garage door remotes, being just one call away.